Please call owner Erin at 919-608-6087. Boat is in Wake Forest, North Carolina. Reduced….Must Go!!!! 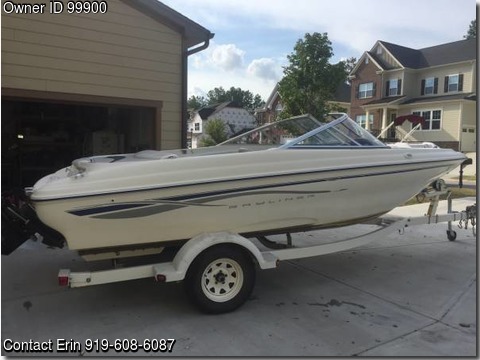 2002 Bayliner Capri Sport 185 had new engine block and manifold installed Summer of 2012 at Wake Falls Marine. Motor is a Mercury 4.3L 190 HP. Low hours on this new engine- less than 40 hours. New trim pump installed 6/2015. Automatic bilge pump installed 8/2012. Has radio with JBL speakers and comfy sun deck. Captain seat has tears but is usable (replacement would be $250). Bottom of hull could use good cleaning. Trailer is in very good condition- recently replaced tires. We are the second owner and have owned this boat since 2006. This has been a great family boat for cruising, skiing, wake boarding and fishing but we have just outgrown it. Title for boat and trailer in hand. Cash or certified check only.